FURLA unveils it F/W 2016 collection, and I think I went weak in the knees at first sight. This season, its all about uncharted territories; where its iconic elegant lines give way for the rebellious and high-glamour streak. Call me a magpie, but I will not apologise for my love of studs in any shape and size. FURLA's Fall/ Winter 2016 collection takes inspiration from its rebellious spirit of the music scene, from rock to pop. With a contemporary interpretation, I'm absolutely smitten over the peekaboo laser cuttings in intricate patterns; and dashed with golden stud embellishments. Another homage to the rock and roll era is evidenced from the bag's shoulder straps, reminiscient to guitar-like straps but duly glamed up with 3-D details and weaves. I'm big on bag charms because I find they leave such a great extra touch to arm-candy and am glad to see some really cute ones in the collection. Strangely enough, I'm always drawn to the Men's selection. The new range is touted as “transgenerational,” adapting effortlessly to men of different ages who never stop dreaming or “playing.” Hoppping on charm-mania bandwagon too, I found adorable as anti-stress fur cubes and the bear, an iconic symbol of the FURLAman. Its all about the versatilty of change, so the pieces have a double personality – sleek and ductile on the outside, but multi compartments inside to organise everything you need, from tablets to smartphones, mints and other daily essentials. And I've saved the best for last: the FURLA 'Made for You' service! In a world where you don't want to be caught with the same bag as another, FURLA's new bespoke arm makes sure that your Metropolis or Artesia bag is truly one of a kind. Choose from a full array of colours, swatches, details and combination. Artesia, I'd like to think is the new power 'suitcase' bag for the moderm woman with its elegant simplistic style. Choose from luxurious textures such as calfskin, ostrich, crocodile, elaphe snakeskin and calf hair for the Metropolis bag while the Artesia can be customised in calfskin and ostrich; and both styles come with leather interiors. Be spoiled for choice with its 39 shades apart from the seasonal assortment. But that's not all! You can also choose the colour of the stitching, of the clasp and of the hand-painted edges, creating unique tonal or contrasting one-of-a-kind effects; as well as a selection of clasps of silver or gold metal, plus black or tone-on-tone enamel. FURLAhas also developed a dedicated micro-site with 3D configurations to enable customers to create their virtual bag by playing around with the various combinations. 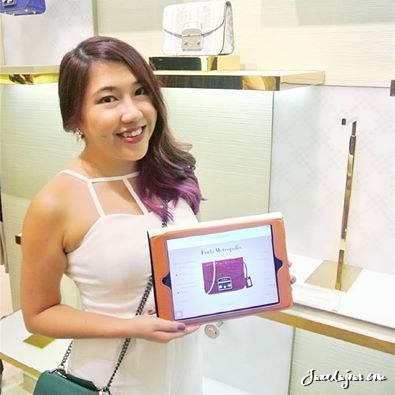 The app will also be available on tablets in the stores allowing the sales assistants to simulate the various bags for the customer. Finally, each bag can be monogrammed or personalised according to the customer’s desire.Each bag comes with a personalised hand-written certificate featuring all of the bag’s characteristics. However, do expect between 8-12 weeks, which is dependent on the material chosen and on the market. Thank you FURLA Singapore and WOM PR for having us!